The Samsung Family Hub Refrigerator allows you to connect with and entertain your family unlike ever before. It contains three built-in cameras that enable you to see what have in your fridge from wherever you are through your phone. With the Wi-Fi enabled touchscreen, you can leave notes/reminders and show off photos. In addition, with built-in Bluetooth speakers and Pandora, you can play your favorite tunes! 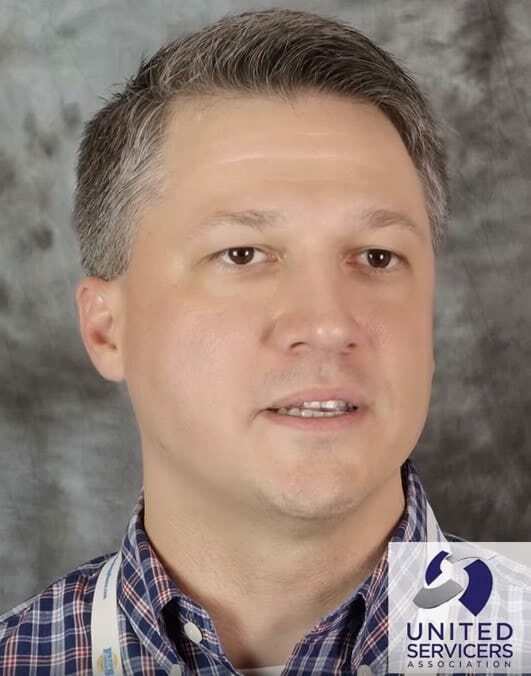 The FlexZone feature allows to the bottom-right door to be a fridge or freezer at the touch of a button (five customizable temperature settings). Follow the link here to read more about the Samsung Family Hub Refrigerator. 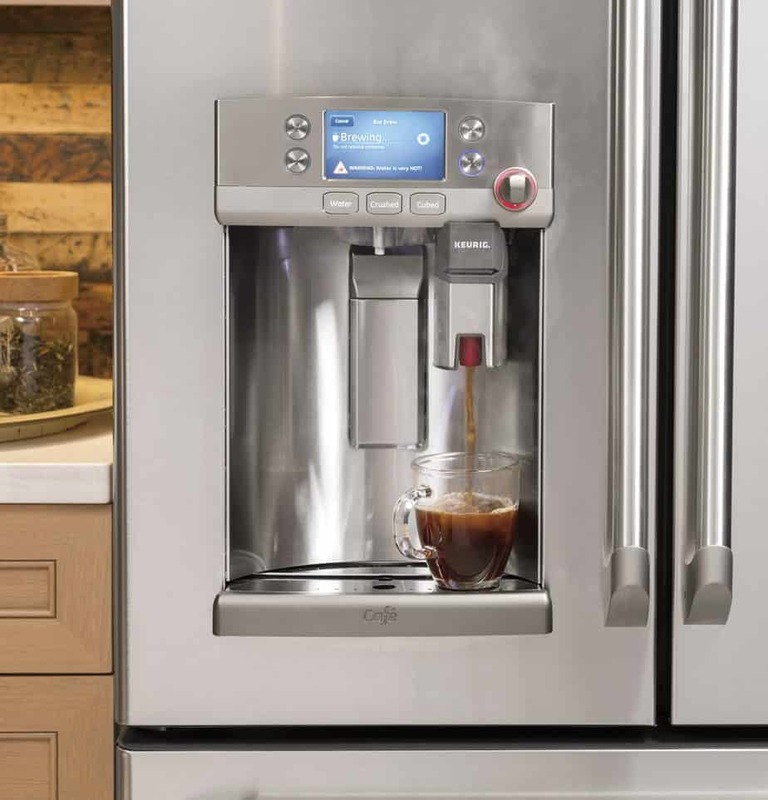 This wi-fi connected GE Cafe Series Refrigerator comes with a Keurig K-Cup Brewing System installed, which allows for the convenience of brewing a hot beverage at your fridge. The hot water dispenser can be scheduled in advance to have hot water waiting for you, any of time of the day. You can keep the measuring cup put away, with the precise fill setting giving you exactly how much water you need for your food or drink preparation. Voice commands of these functions are enabled with Amazon Alexa! And with separate climates using TwinChill evaporators, it keeps fresh food cool and freezer food frozen. Find out more about this model here. 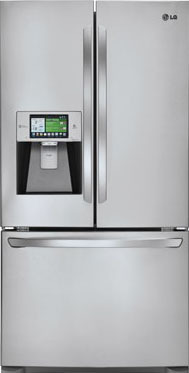 This 3 door LG Smart ThinQ Refrigerator combines superior interior capacity with LG’s Smart Thin Q technology. Have last minute party plans and need ice ready to go when you get home? No problem. 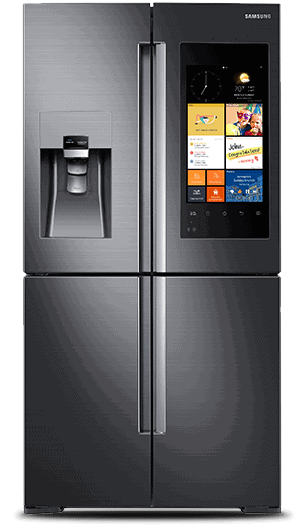 Connect this fridge with your smartphone and you’ll be able to activate the Ice Plus feature to make sure you won’t be needing to make any runs to the store for ice. 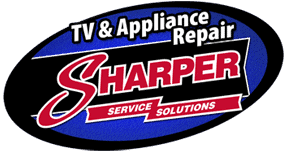 Also, you’ll never need to about when to replace the refrigerator’s fresh air filters or water filters. The SmartThinQ app will alert you whenever it’s time to replace them, so your fridge will stay fresh. See more about this LG Smart ThinQ model here and here.